The ancient kings of Assyria had an interest in collecting animals and plants stretching back at least as far as Tiglath-Pileser I (reigned 1115 - 1076 BCE), who extended the Assyrian empire to the shores of the Mediterranean and Black Sea. 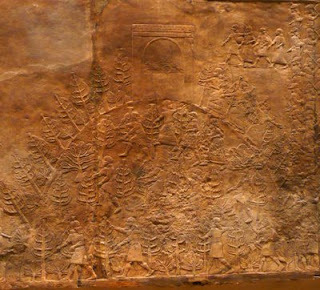 He wrote of ‘Cedars and Box I have carried off from the countries I conquered, trees that none of the kings my fore-fathers possessed: these trees I have taken and planted in my own country, in ... Assyria’ (Penelope Hobhouse, Plants in Garden History). Four hundred years later, Sargon II (722 – 705 BCE) laid out parks north of Nineveh, around Khorasabad, where he grew cedars, cypresses, junipers, dates, olives, almonds, apples, pears, quinces, figs, grapes, ebony, oak, terebinth, ash, tamarisk, oriental planes, willows and poplars. A bas relief (c. 715) shows this park to have had a man-made hill planted with a grove of trees, along with a small temple. It is one of the earliest depictions anywhere of a managed landscape. Sargon II’s son Sennacherib (reigned 705 – 681 BCE) built his own palace and gardens at Nineveh from around 700. The relief below is a detail from the South-West Palace showing the capture of prisoners at Lachish, a city in the rebel kingdom of Judah. The prisoners are being marched through a rocky landscape of vines, fig trees and possibly olives. Another relief from the palace shows giant reeds (up to 25 feet high) which were introduced from the marshlands of the Tigris and Euphrates to the landscaped parks of the empire’s northern cities where they provided cover for game as well as building material and fuel. Hobhouse quotes Sennacherib’s description of the irrigation system: ‘to dam up the flow of water I made a pond and planted reeds in it... at the command of the gods, the gardens with their vines, fruit, sirdu wood and spices waxed prodigiously. The cypresses, palms and all other trees grew magnificently and budded richly’ (The History of Gardening). Sennacherib was murdered in 681 and succeeded by Esarhaddon (680-69 BCE), who planned another great garden based on the vegetation of the Amanus mountains near the Black Sea. His successor Ashurbanipal (668-27 BCE) is renowned for creating the great library at Nineveh. 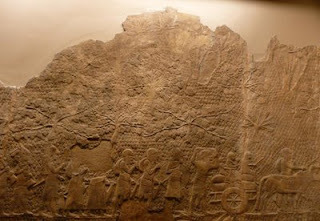 The British Museum has a series of reliefs showing scenes from a lion hunt, including the one I photographed here which shows Assyrians rushing up a wooded knoll crowned by a building. Penelope Hobhouse describes another delightful scene in a relief dated 645: King Ashurbanipal and his Queen sit in the royal park in Nineveh dining under an arbour of grape vines. ‘In a neighbouring part of the garden the decapitated head of the conquered king of the Elamites hangs from a tree’ (Plants in Garden History).